Category Archives: Kick Out Capita! Monday, 1st April 2019 was officially the first day back in-house for formerly outsourced Capita Finance and Human Resources staff. This means the first stage of Barnet councillors’ review of the Capita contracts has been completed. 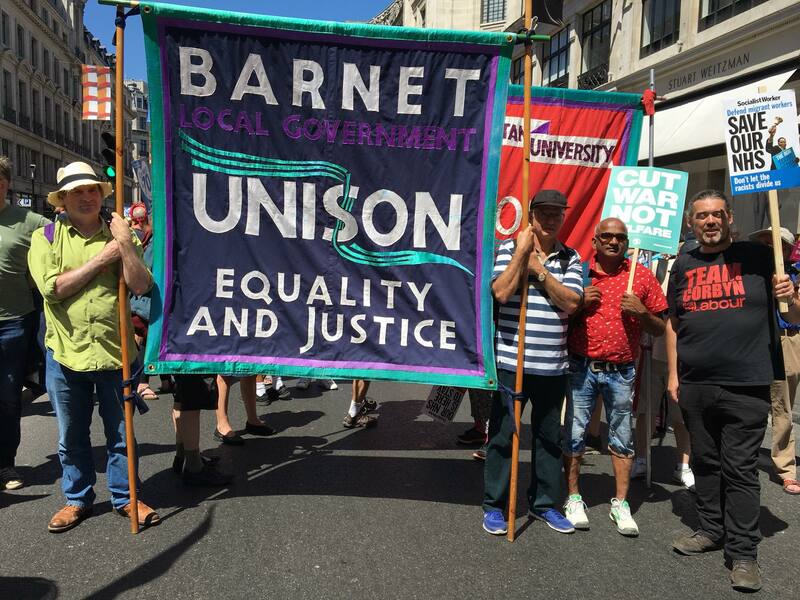 Barnet council is locked in two draconian contracts with Capita, which were a bad deal for residents and workers from the start. The borough saw a huge waste of public money and a steady deterioration of services’ provision across the board, evident in Barnet’s dirty streets, shocking state of disrepair of its roads and pavements and inaccessibility of the council’s Customer Services to name just a few problems. 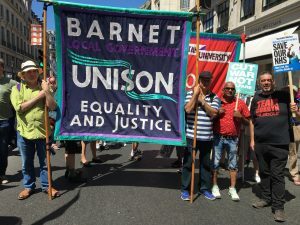 After years of campaigning, some Barnet residents, members of Barnet Alliance for Public Services and the #KickOutCapita campaign, welcomed back the workers on their first day back into the council. 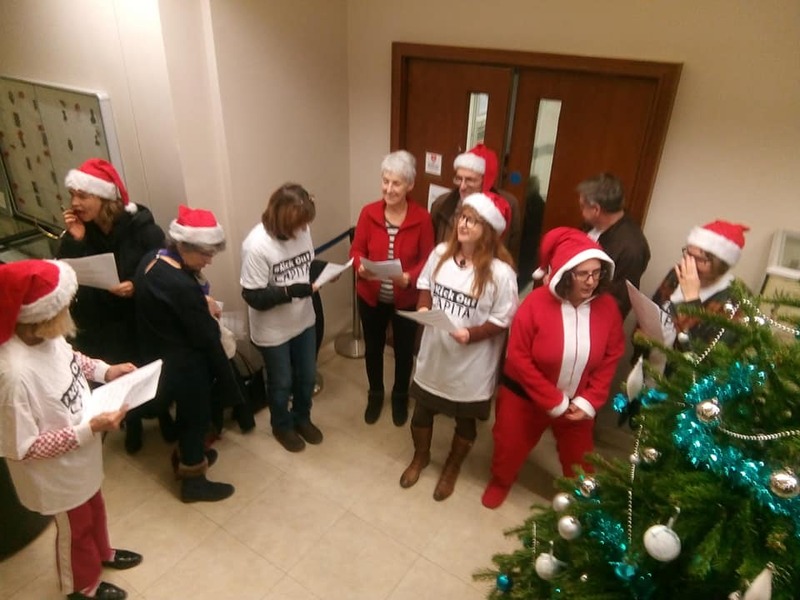 By this the residents also sent a very clear message to Barnet Council: We want to see the return of ALL the former council services currently provided by Capita back in-house without delay. We will not give up campaigning until all of the services return in-house! Cllr Zinkin also said of Capita that it had “days or weeks” to resolve longstanding problems with the Capita-run pensions administration service for council employees. According to officers at the meeting, the pensions regulator is getting “fed up” and demands “action, not words” after it was revealed two years ago that the quality of data on the system is inadequate and does not conform to regulation standards. However, In response to a demand by Labour Councillor and committee member, Arjun Mittra, that the Council should consider bringing the service back in-house, Cllr Zinkin said that that was not likely, and that he would prefer the service to continue to be privatised, but to a different contractor. Labour councillors got agreement at a recent Policy & Resources Committee that bringing the pensions administration service back in house would be considered in the review of the next tranche of Capita services. On Wednesday 20 February 2019 at 7pm Hendon Town Hall Mr Reasonable aka John Dix, locks horns with easyCouncil over their precarious finances. His attempts to get Barnet Tory Councillors to see sense is legendary. Despite more and more evidence of financial mismanagement by Tory easyCouncil they refuse to learn lessons by Kicking Capita out of Barnet. Mr Reasonable: Capita are not performing well in Barnet – But look who is saying that. Join Mr Reasonable Wednesday 20 February 2019 at 7pm Hendon Town Hall. Capita have failed to action a key recommendation from the Grant Thornton report into a £2m fraud committed by a former Capita employee, according to a report discussed at Barnet Council’s Audit Committee (31 January). Recommendation 15 seeks to ensure the Council’s payment system (BACS) is reviewed for the adequacy of controls over new suppliers where there is no purchase order, to make sure the Council is paying the correct bank accounts. This is a “High immediate” priority, as misuse of the BACS process and a lack of checking basic details such as bank accounts was a key reason the fraud was allowed to happen. Grant Thornton, Barnet Council, and Capita all agreed to the action, but one Capita employee at a remote location disagreed and decided not to implement it. The news was met with disbelief from both Labour and Conservative Councillors. 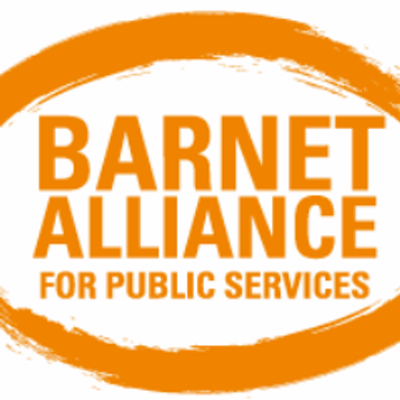 Barnet Alliance for Public Services (BAPS) have produced this guide to help maximise residents participation in the Council consultation on Capita. To this end, we have provided some suggestions as to how you might want to complete the survey. The online consultation can be found here. If you wish, you can review the questionnaire in a PDF format here before you fill it. The consultation will close on the 15th of February. Please make sure you fill it. If you know of anyone who would prefer to fill a paper questionnaire please let us know. BAPS is very much aware that not all Barnet residents are online and have subsequently asked that hard-copy versions are provided for residents to be able to complete. Furthermore, we have asked the Council to provide an Easy Read version. All of the hard–copy versions should be made available at all public buildings, including libraries, Barnet House and North London Business Park. Barnet Trades Council and Barnet Alliance for Public Services are concerned and dismayed that Brent Council wants to renew its contract with Capita. 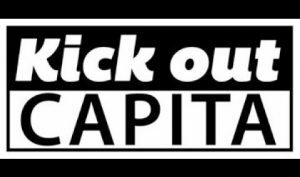 Our experience of Capita is that it has delivered appalling service and therefore we, together with our local Labour Party, are campaigning for all services run by Capita for Barnet to be brought in-house forthwith. #kickoutcapita is our grass-roots campaign. We urge Brent Council not to renew its contract with Capita. Capita, along with other failed and failing outsourcing giants like Carillion and Interserve have proved to be entirely failed models. We want to Kick Out Capita from Barnet and bring all services back in-house and under local democratic control. Brent Council should do likewise. The shadow chancellor, John McDonnell has spoken brilliantly about how properly funded, democratically accountable in-sourced public services are the future for the country and we agree. Together we are stronger. 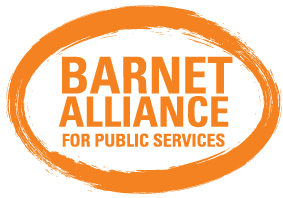 On Tuesday 15 January at 6.30 pm, Greek Cypriot Centre, BAPS is meeting to discuss how to produce a guide to complete the Barnet Council Capita consultation. Attached – the questionnaire in PDF for ease of consideration, courtesy of Derek Dishman – Mr Mustard. The purpose of the meeting is to agree a resident’s guide to completing the survey. We will need to widely circulate the guide to as many residents as possible. Time permitting we will also discuss #Bingate. Please try to circulate the BAPS meeting and the content through all your contact lists etc. Read the Hendon Times report here.